How Do You Become the Most Popular Ozone Sauna System in the World? for over 6,000,000 users in over 57 Countries! Longevity Resources Ozone Sauna Packages are an "All in One" Package of Longevity's Award Winning Products. 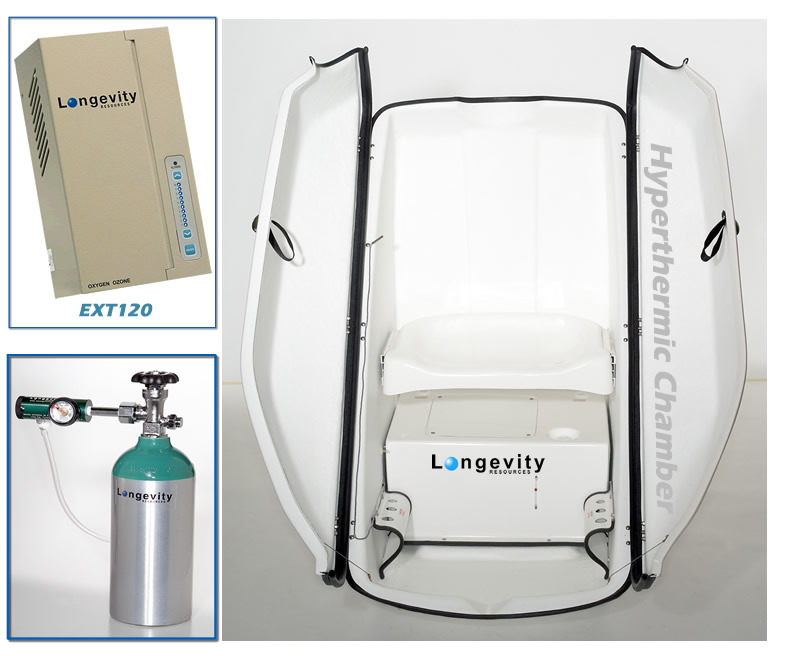 Each Package consists of a Steam Sauna Cabinet, UltraPure Output Ozone Generator, and an Oxygen Source. They come fully assembled, easy to use, with outstanding instructions, and Live Customer Support should you have questions. The Longevity Team has assembled several packages together to suit your budget and your needs. You can also customize any package to suit your specific needs and desires. Longevity's Legendary Support Team can help you to choose the package that's best for you, in a friendly and supportive manner. Scan the packages below, then call Longevity or send an email to purchase or with your questions. A competitively price high quality reliable Ozone Sauna Package for home or commercial use. The Cyclone Ozone Sauna Package is your opportunity to purchase the highest quality products in the Ozone Industry at an extremely competitive price....a full ozone sauna package for less than $4000 USD!! Sauna => Cyclone Steam Sauna Cabinet: Ozone Proof WIDE Double Door Steam Cabinet with external Cyclone Steam Generator both CSA And UL Approved! Oxygen Source => Oxygen Tank and Oxygen Regulator; the most economic choice! Easy to fill, easy to use. Optional Upgrades => Upgrade to an OxyMax Oxygen Concentrator as the oxygen source. For more features or more accessories see the other Longevity Ozone Sauna Packages below or call or email Longevity Resources Inc. Product Specialists for help in choosing the Ozone Sauna that is perfect for you! 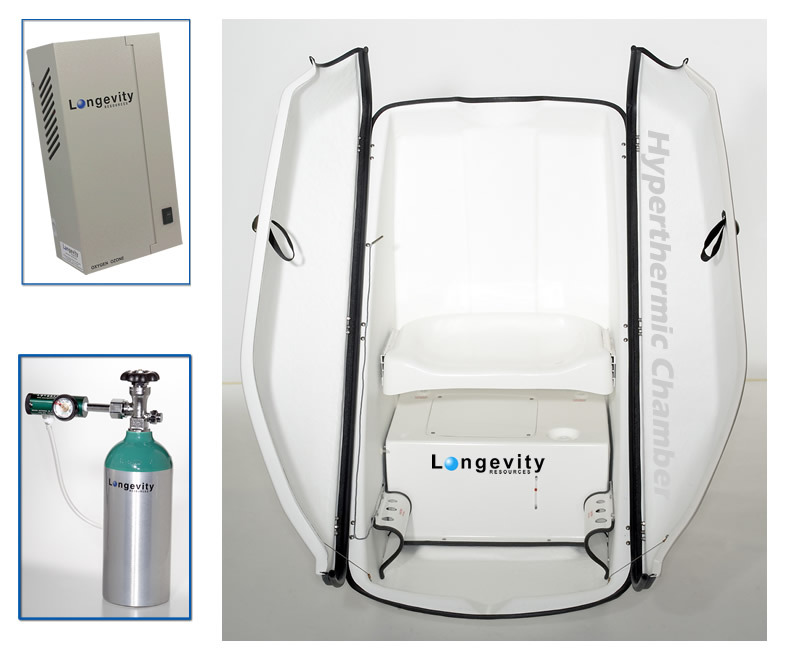 The Silver Package includes the Hyperthermic Chamber Steam Sauna Cabinet, undeniably the highest quality "Best in Class" Steam Cabinet on the world market today, with Proven Quality though QAI Laboratory testing and with the convenience of Remote Control of the Time and Temperature. This wider range of options and controls still comes at an extremely competitive price for home and commercial users. Sauna => Hyperthermic Chamber Sauna Cabinet: Proven Quality and Safety through QAI Laboratories independent testing, WIDE Double Doors, Hand Held Remote Control to change time and temperature from your seat in the sauna, plus much more (If you have not read about all of the amazing Features of the Hyperthermic Chamber and how they will enhance your Ozone Sauna Experience you just have to Click Here). The Gold Ozone Sauna Package includes the Hyperthermic Chamber Steam Sauna Cabinet, with Proven Quality though QAI Laboratory testing and with the convenience of Remote Control of the Time and Temperature. This Gold Package also includes an upgraded EXT120 Ozone Generator (with Quartz Glass Electrode) for a wider selection of UltraPure ozone concentrations. Optional Upgrades => Upgrade to an OxyMax Oxygen Concentrator as the oxygen source; you could also upgrade to the EXT120-T ULTRA Ozone Generator with built in Digital Countdown Timer. 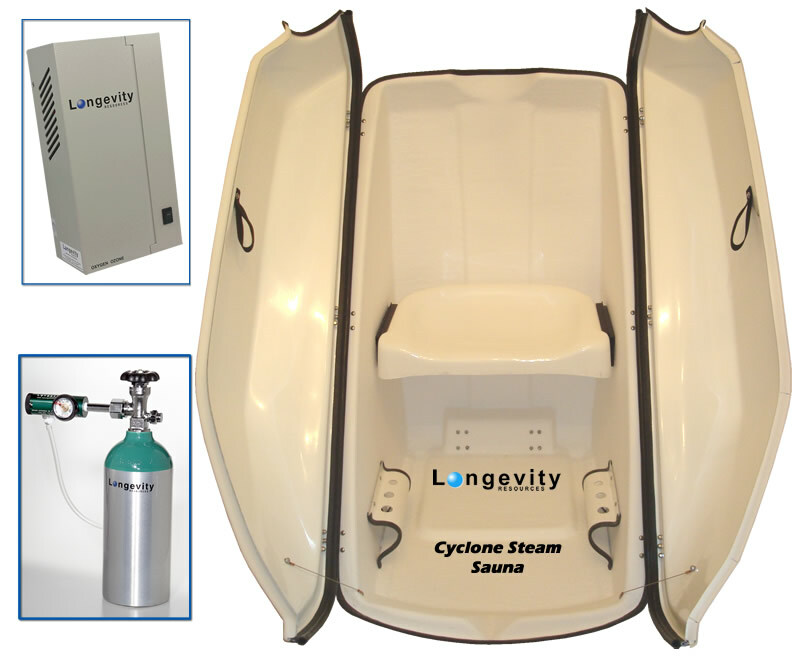 Designed by Dr. Frank Shallenberger MD in cooperation with Longevity engineers, Longevity's SEOS: Super EWOT Ozone Sauna is a game changer. EWOT and Ozone at the same time => and no need to exercise! The SEOS: Super EWOT Ozone Sauna is unique...nothing like it on the world market today! The occupant breathes only purified oxygen from the OxyMax Oxygen Concentrator and no outside air. The OxyMax is a "Single Source" of oxygen, no need for any large space consuming bags full of oxygen that can require hours to fill, or multiple oxygen concentrators...just one smooth, quiet OxyMax Oxygen Concentrator that is ready immediately. Sauna => Hyperthermic Chamber Sauna Cabinet: Proven Quality and Safety through QAI Laboratories independent testing, W-I-D-E OPEN Double Doors, Hand Held Remote Control to change time and temperature from your seat in the sauna, plus much more (If you have not read about all of the amazing Features of the Hyperthermic Chamber and how they will enhance your Ozone Sauna Experience you just have to Click Here). Ozone Generator => EXT120T "ULTRA" Ozone Generator: Widest UltraPure Ozone Output Range in the world, from 1 ug/ml - 120 ug/ml, suitable for all Ultrapure Ozone protocols because the ozone is from Longevity's 100% Quartz Glass Electrode, built in timer adds convenience as the ozone and sauna shut off at the same time. Optional Upgrades => Upgrade to a Quantum Ozone Generator, an OxyMax 24 Liter per minute oxygen system, or add any additional accessories that you like. The options are endless and our Longevity Product Specialists are specially trained, and specially chosen to provide you with heartfelt happy assistance in choosing the accessories that fit your needs and budget. EWOT (Exercise With Oxygen Training) normally requires, well, "exercise"! With the SEOS you can obtain all the benefits of EWOT while sitting and relaxing in a steam sauna, the Hyperthermic Chamber! Email or Call Longevity Product Specialists today to learn more! SEOS will become your best friend and favorite ozone/oxygen mate!